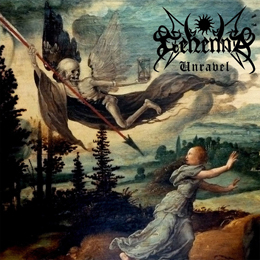 Anaal Natrakh, Burzum, Darkthrone, Satyricon, and some other Norwegian black metal come into my mind when I listen to the songs of Unravel, at times very hymnic and melodic, then icy cold and fast, combined with the bone-dry production sounding basic as Gehenna does without any detours. Yet this album has one big flaw for my ears, yes, again, the vocals which destroys much of any upcoming atmosphere. There are a couple brilliant songs on here that are the “Nine circles of torture” and “Death enters” but it don’t last long and sadly falls into the black metal cliché trap of sounding like a bunch of other bands and becomes pure wallpaper and nothing more.